Visitors can get into the holiday spirit with this list of spectacular light displays. These displays generally are up from the weekend after Thanksgiving through the end of the year and offer guests walking experiences as well as drive-through displays and visits with Santa for the kids. Holiday Lights on the Riveris a drive-through attraction with more than 400 light displays around a two-mile loop through Saluda Shoals Park just down from the Lake Murray Dam outside Columbia. Park and enjoy the Wetland Wonderland Walking Trail, a laser light show and a winter wonderland ride suitable for the whole family. A holiday gift shop and concessions are available, as well as photos with Santa. Lights Before Christmas at Riverbanks Zoo is Columbia's oldest light display, with nearly one million twinkling lights depicting the holidays and spotlighting Riverbanks' animals. Have your picture made with Santa and roast marshmallows at the Jingle Bell Bonfire. Be sure to dress for the weather - it snows every night! Food vendors are also on hand if you get a little hungry. Holiday Festival of Lights at James Island County Park near Charleston offers more than two million lights in holiday designs on a three-mile driving tour. But the festival of lights offers much more, including a sand sculpture, a train ride, treats from Santa's Sweet Shoppe and a Victorian carousel. Kids can even try to design their own light display. Festival of Trees at Ripley's Aquarium at Broadway at the Beach in Myrtle Beach features more than 100 uniquely decorated trees celebrating the diversity of the United States. The trees are part of regular admission to Ripley's Aquarium. One highlight of the festival is the tree scavenger hunt, which offers guests a chance to show off their knowledge about the 50 states. Harbour Town Lights in The Sea Pines Resort on Hilton Head Island includes a 30-foot Christmas tree and holiday light displays around the marina. The celebration includes a variety of special events on different nights, including concerts, visits with Santa and musical performances. Visitors can also do some good this holiday season by bringing canned goods and new unwrapped toys for children. Nights of a Thousand Candlesbrings the soft glow of 4,500 candles and countless sparkling lights to Brookgreen Gardens in Murrells Inlet. Visitors can hear handbells and carolers and enjoy a cup of cider as they stroll through the award-winning gardens and sculptures. The event also features a wide selection of catered dishes, a peppermint forest in the children's garden and an ice garden. Two indoor exhibits also bring the holidays to life through art and horticulture. Holiday Lights on the River, Saluda Shoals Park, 6071 St. Andrews Road, Columbia, 803.772.3903. Open 6-10 p.m. daily all of the month of December. Lights Before Christmas, Riverbanks Zoo, 500 Wildlife Parkway, Columbia, 803.779.8717. Holiday Festival of Lights, James Island County Park, 871 Riverland Drive, Charleston, 843.795.4386. Open daily 5:30-10 p.m., one hour later on Friday and Saturday. Festival of Trees, 1110 Celebrity Circle, Myrtle Beach, 843.976.7243. 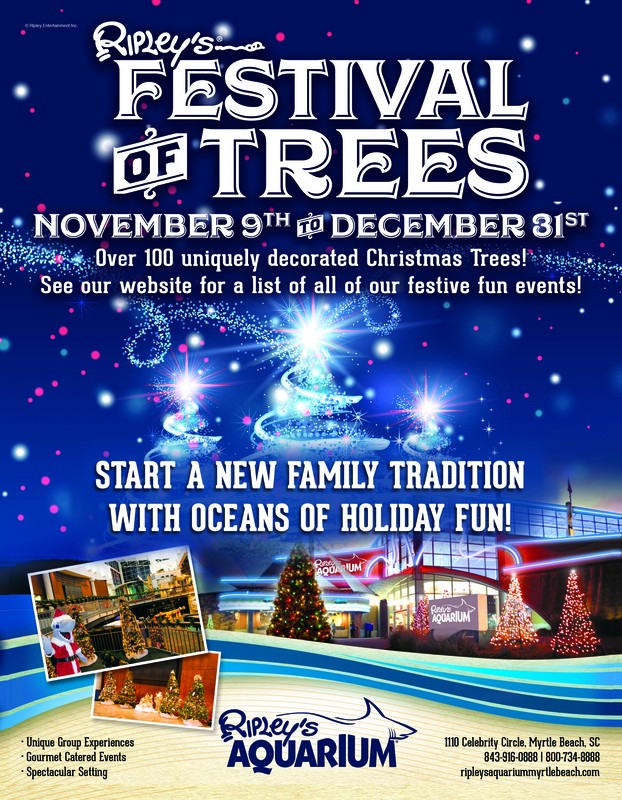 Festival of Trees is included in regular admission to Ripley's Aquarium. The aquarium is open 9 a.m. to 9 p.m. Monday through Saturday, 9 a.m. to 7 p.m. on Sundays. Harbour Town Lights, 32 Greenwood Drive, Sea Pines, Hilton Head Island, 843.842.1979. Admission is free, but bring a canned good or gift for the Deep Well Project. Open daily from the Friday after Thanksgiving to Jan. 1. Nights of a Thousand Candles, Brookgreen Gardens, 1931 Brookgreen Drive, Murrells Inlet, 843.235.6000. The festival runs a total of 11 nights over three weekends, 3-10 p.m.